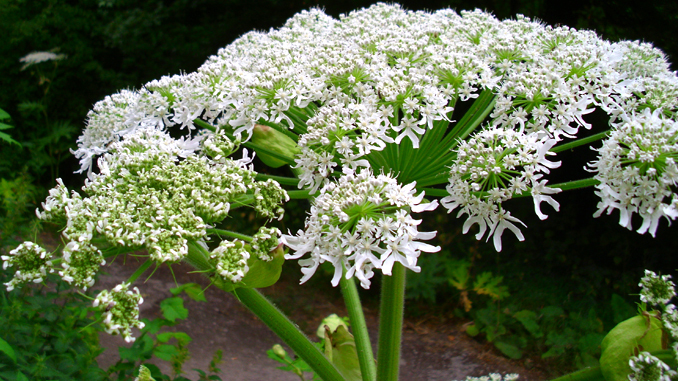 Giant Hogweed isn’t new to Ontario, but the public has recently become much more aware of it. As a result, the phone lines for the toll free Invading Species Hotline have been ringing constantly with questions and concerns from landowners about the invasive plant that is spreading across Ontario. The hotline is a service of the Invading Species Awareness Program, a partnership of the Ontario Federation of Anglers and Hunters (O.F.A.H.) and the Ministry of Natural Resources (MNR). Also known as giant cow parsnip, giant hogweed was brought over to North America from Asia in the 1800’s as a garden plant, but like many nonnative species, has become naturalized. It is a perennial and can grow to five meters in height, with flowers that form an umbrella shaped top. When the sap, found throughout the plant, comes in contact with the skin it causes photodermatitis, so that when the skin is exposed to sunlight it blisters and burns. Contact with the eyes can cause temporary or permanent blindness. Given its immense size and noxious effects, the O.F.A.H. and the Ontario Invasive Plant Council (OIPC) are urging those dealing with the plant to seek professional help in removing it, or at the very least, to learn how to safely remove the plant and fully protect themselves before proceeding. The OIPC is a non-profit, multi-agency organization comprised of conservation authorities, academic institutions, aboriginal organizations, stewardship networks, private consultants, industry and environmental non-government organizations, as well as all levels of government. The OIPC works to facilitate a coordinated provincial response to the growing threat of invasive plants. To learn more, visit www.ontarioinvasiveplants.ca.